I am a paraprofessional tutor with a great deal of experience working with preschool, elementary, and special needs clients. From assisting emergent or struggling readers, to elementary and consumer math, I have enjoyed working with students one on one and in small groups for some years. I can bring materials and research support curricula for the subjects, and can also support test preparation for both content coursework and standardized tests. Feel free to contact me if I can be of assistance. Rate details: Special discounts for language related studies in English, Spanish and French. Contact me to inquire further. I have worked with elementary students in varied settings using both dedicated or directed curriculum and researching subject support media. I have found that most students thrive in an environment that is supportive and I also enjoy the process of watching students master new challenges, which leads so often to an improved sense of competence and confidence. I have an intensive and comprehensive phonics program that is most suited for auditory learners but can be adapted for other learners as well. It simply involves using a catalog approach to decoding whereby all combinations are covered and students can then decode anything. I have used this with some learners who are developmentally delayed and also with young learners in preschool. It would not be ideal for older readers who are struggling unless they are motivated to learn. I am an amateur poet, polyglot and lover of words who has been privileged to assist many students with writing, language skills and large projects. Would it help if I prefaced all of the descriptors below by saying that I have taught Bible classes for several churches for years, for Vacation Bible School, for Fine Arts-Bible camps geared towards exceptional needs adults, and served as a speaker for several Women's Ministry groups? I am a volunteer facilitator in several spiritual formation processes that are Biblically based and am also part of a learning community and a leadership training group based on missional living and creating disciples. I have had occasion to create simple and intermediate studies for middle school aged children, young adults and exceptional needs adults using text in combination with images from classic art, commentaries and language studies and have a reasonable grasp (for a layperson) of the diverse perspectives on doctrine that are considered orthodox by most believers. My approach is collaborative and affirming, since I believe that we are all engaged in the practice of theology and of a personally conceived orthodoxy. 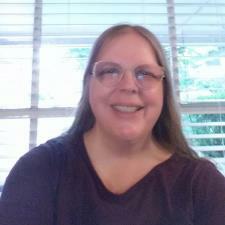 I am a volunteer Disability Services Coordinator for a local non-profit and mentor several autistic teens in that capacity with respect to academic skills and to job prospects. I also engage collaboratively with the parents of these teens in the design of supports for endeavors such as small business proposals (auto detailing, lawn mowing) and life goals (saving for a first car, seeking out community resources for mentoring, counseling and health concerns). Practically speaking, I am a full-time paraprofessional companion to an autistic young adult and have additional recent experience tutoring early elementary school, middle school and high school students with this diagnosis, particularly in English, Spanish and ELA. I have provided private at-home education for one developmentally delayed and visually impaired young student whose diagnosis of toxoplasmosis at birth presented with additional complications (1996-1998), and whose teen sibling had both bipolar and ADHD and for whom I also provided tutoring after school and support for larger academic projects. I have provided at home education for clients awaiting admission to Monarch (gifted and talented student on the spectrum for Autism, then called Augsberger's, for clients awaiting admission to Woodlands Preparatory School (young student with ADHD entering kindergarten), and for students as an employee and volunteer tutor in preschool, camp and other enrichment settings. I have provided case management assisting HCS clients with the location and vetting of a new HCS service provider and with providing support after entry (A Unified Care Group) and am a volunteer Disabilities Services Coordinator for a small church. I am a full-time aide to an adult with exceptional needs, provide instruction and recommendations for support to exceptional needs teens to facilitate community integration for New Life CRC, have run fine arts camps with a craft/ VBS theme for Home Place of Texas (an HCS approved residential and day facility) for 2012, 2013 and 2014 and have collaborated with parents, teachers, staff and clients of all ages in teaching, coaching and advocating.